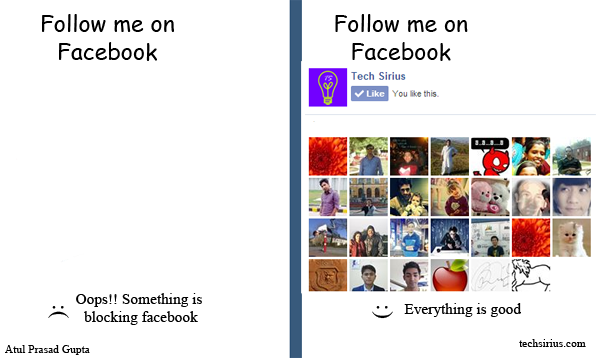 Many times it happen when you open a webpage in your browser whole page loads just fine but not facebook like button, facebook page feed, twitter share button, linkedin share button, google plus one button etc. It is because of browser addons/plugins, like avast online security, Adblock plus etc., block them. Well it is no problem for visitors but webmaster do not like it much. Here are few solutions that find out if social plugins like Facebook, Twitter, Linkedin have been blocked by browser 's add-on/plugin. Suppose If facebook SDK did not load then replace blank spots(where facebook buttons/content suppose to display) with some useful content or you can do other cool stuff, so let's get start it. Copy and paste below code just before </head> tag. You can also detect google plus, pinterest and other social network JS library on your website using similar method.